Tinsnips in hand, he slices a beer can into small pieces, which he then hammers flat and finally nails to a wooden board. 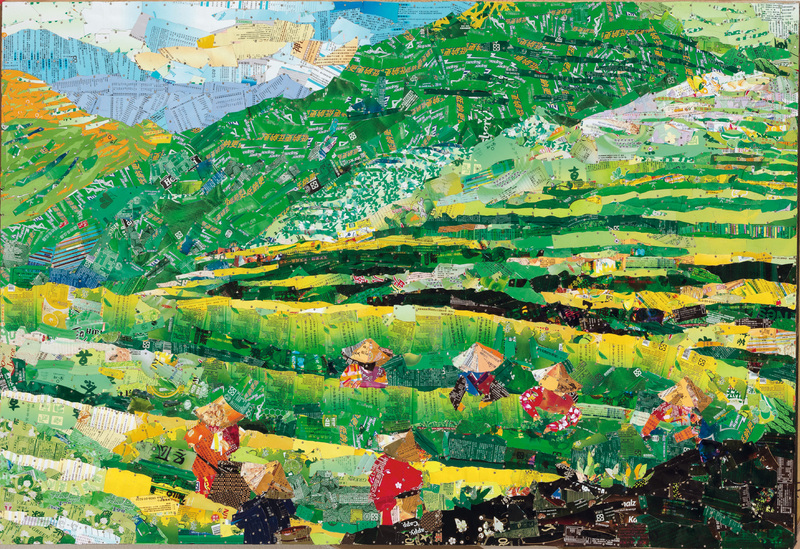 Hu Dar­far, using a mallet as his brush, metal shards as his pigments, and a wooden board as his canvas, produces images of the mountain town of Jiu­fen as it exists in his memory. This master of metallic art, truly an authentic product of Taiwan, is a global outlier in using this unusual technique, and he has been invited to exhibit or teach in the US, Japan, mainland China, and Korea. He has also won a number of prestigious prizes, including Taiwan’s Ju Ming and Nanying awards. The three keys to understanding the life of Hu Dar­far are “Jiu­fen,” “metal goods,” and an interest in “art.” Born in the historic mountain town of Jiu­fen, Hu left in his 20s, moving to Tai­pei to find a job. From working for someone else to starting up his own business, Hu’s entire working life has been in the buying and selling of metals and metal objects. He only ventured into art at age 60, when, renovating his old home, he came up with the notion of decorating the empty walls with art. 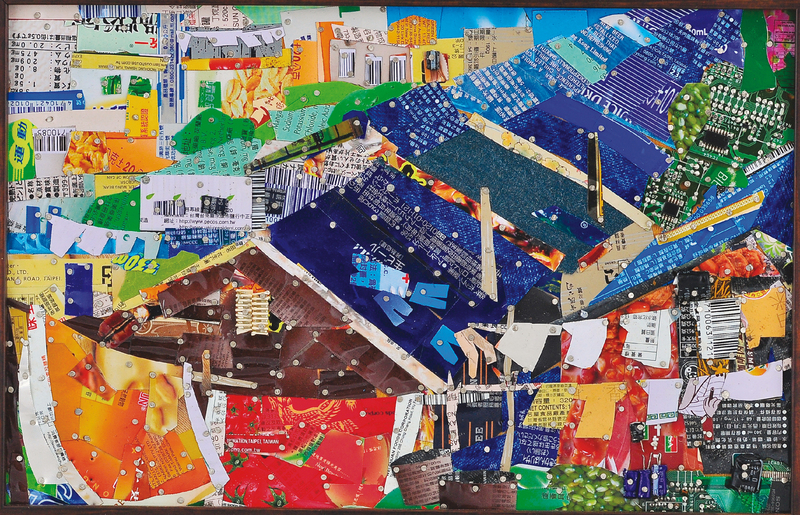 With no previous instruction, operating only according to his own inspiration, Hu used the objects at hand—hammers, nails, and cans—to assemble, in time with the rhythm of hammer blows, mosaics based on his memories of his hometown of Jiufen. Mining was dangerous work, and miners never knew if they would even be alive tomorrow to spend what they earned today. Not surprisingly, they were free spenders, and the town had every kind of entertainment establishment of that era—pool halls, a movie theater, restaurants, taverns…. Jiufen attracted gold prospectors from all over. Those who struck it rich built themselves two- or three-story concrete Western-style houses, while newcomers had to get by with makeshift shelters made from straw to protect themselves against the wind and rain. Sometimes you could even see both extremes on opposite sides of the same street. It is details like these in Hu’s works that really bring to life at one glance the heady days of yesteryear. In his creations Hu also captures the charming simplicity of the norms and daily customs of those days. One work, entitled Carrying Seats to Attend a Banquet, vividly illustrates how neighbors would contribute chairs from their own households whenever there was some large catered event like a wedding. The town is small and compact, so homes have only very limited space, and as a result no one had enough furniture for larger gatherings. The work portrays parents shouldering benches and leading their children along, heading off to attend the scheduled start of the festivities. Since Jiu­fen rests against a steep slope, the houses are literally piled one on top of the other, and often one man’s window opens onto the next man’s roof. When the weather was good and people brought their duvets out onto these roofs to air in the sunshine, it looked like a contest to see who could put on the most colorful display. The image of items such as baby’s diapers, wraps and Japanese-style attire hung out to dry on long bamboo poles is especially effective, since the metal pieces are nailed to the wood at an angle, making them appear to be blowing in the wind. These images of a simpler time are evoked in Hu’s works Airing Duvets in the Sun and The Happiness of a New Life. 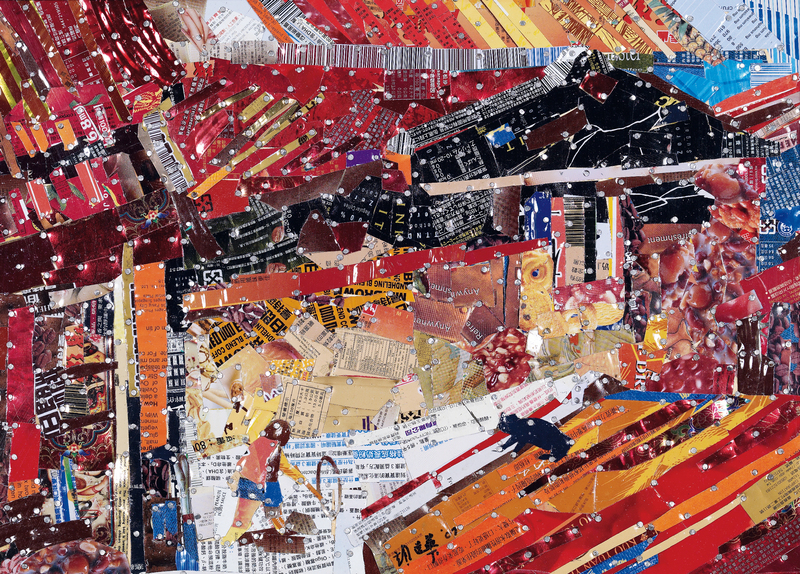 Hu coined a Chinese term to describe his genre that literally translates as “nail paintings.” At the beginning he used scrap metals like discarded nails, screws, steel wire, and aluminum strips. Metal is cold and bleak in its sensory impact, and each individual piece of scrap metal has a uniform coloring, bringing a certain starkness to Hu’s earliest depictions of Jiu­fen. Later, in order to add color to his works, Hu began to use pieces of metal containers from things like powdered milk and other canned goods. These became his palette of pigments, bringing nail paintings from black and white to a world of color. However, Hu is still limited to the colors that come on the cans, and he cannot mix his own hues. As a result, Hu’s nail paintings have a certain impressionist effect in their use of color. For example, a green patch in a work by Hu will not be a pure single color, but will have different shades overlapping, and it wouldn’t be in the least surprising to find strips of blue or yellow mixed in. In the early days, it was a headache for Hu to find enough colored metal. But now that his friends all know that he puts recyclable cans to use as art materials, from time to time people will leave bags of discarded cans at his doorstep. And whenever he goes abroad he makes a special effort to collect pop-top cans with unusual or exotic local colors. Hu has been invited to hold quite a few exhibitions overseas. 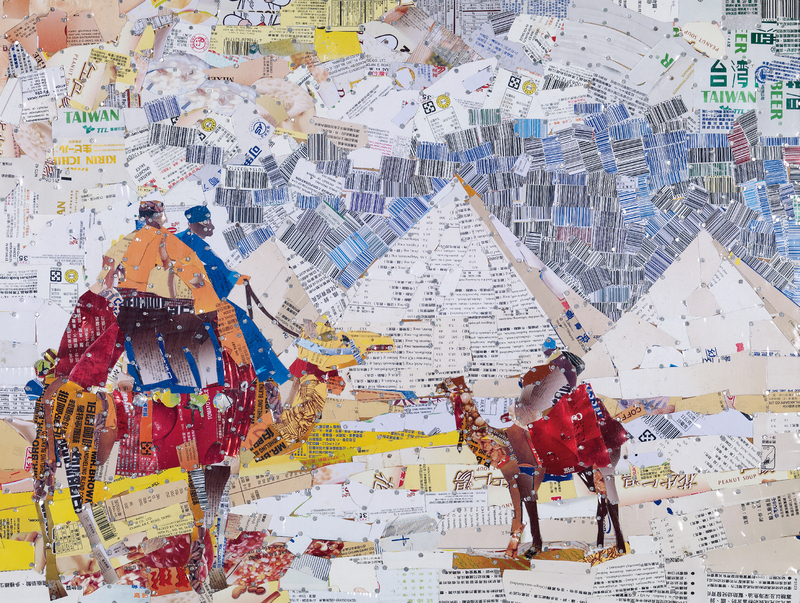 To make his work more accessible, he does not describe his work using a literal translation of the Chinese term “nail paintings,” but instead calls them “metal mosaics.” There is also another secret ingredient in his works: He can never bear to cut the word “Taiwan” out of any material, meaning that it ends up embedded in each work. “This saves the trouble of explaining to foreigners,” Hu says with a laugh. 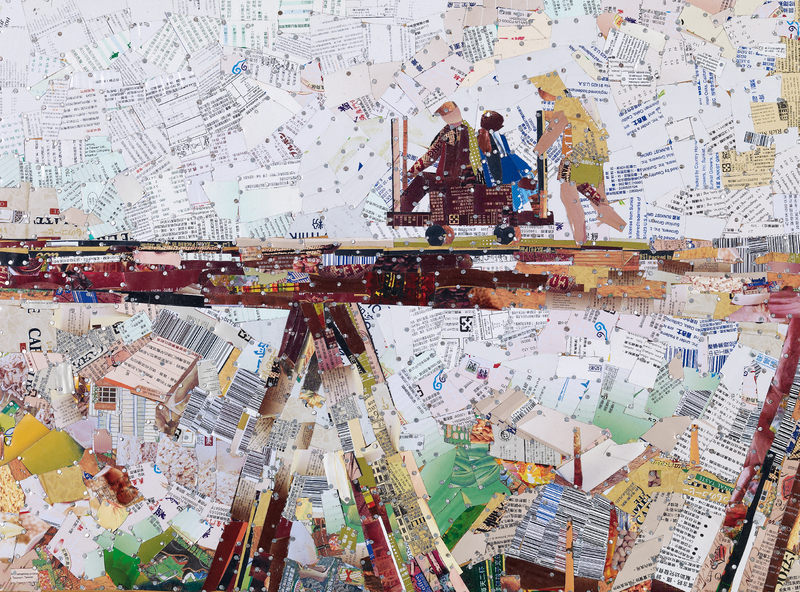 In addition to capturing the nostalgic and touching simplicity of Jiu­fen through his metal mosaics, Hu is also able to exploit the surface texture of his material—chilling, forbidding, and reflective in a way that plays tricks with the light—to produce the visual effects of the fog that frequently envelops this mountain town. Looking at works like Clear Sky Through the Mist or Bridge Through the Mist, the viewer can’t help but feel absorbed into a mountain realm of pea-soup haze. 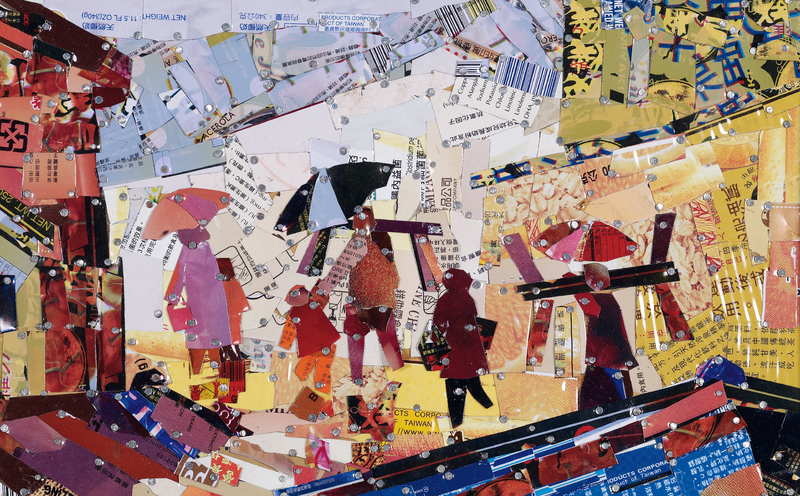 The 2004 work Rain over Kee­lung Harbor is an even more dynamic demonstration of Hu’s ability to use metal materials to express soft, malleable textures. The work, assembled on five long wooden boards each 92 × 55 centimeters, has a total length of 460 cm, making it similar to a traditional Chinese horizontal scroll painting (which can be unrolled to provide a panoramic vista). Hu made three special trips to Kee­lung for this work, making detailed observations of the entire harbor setting, and then used layered colors to create the effect of a fine rain, slanting in the wind, drizzling down on the port city. Hu is even able to evoke human emotion with his deft handling of his material. Grandparent and Grandchild Walking depicts the two subjects ambling up a stone staircase. The elder’s head is slightly tilted, as if hovering protectively over the child. Meanwhile, the two figures in Walk in the Rain struggle as they walk forward with their umbrellas tilted against the driving rain, the tails of their long overcoats being blustered away from their bodies, in a masterful evocation of daily life amidst the dreary and relentless rains that are part of Jiufen’s climate. Hu, who has never received any instruction in the fine arts, is not limited by preconceptions about modes or materials. 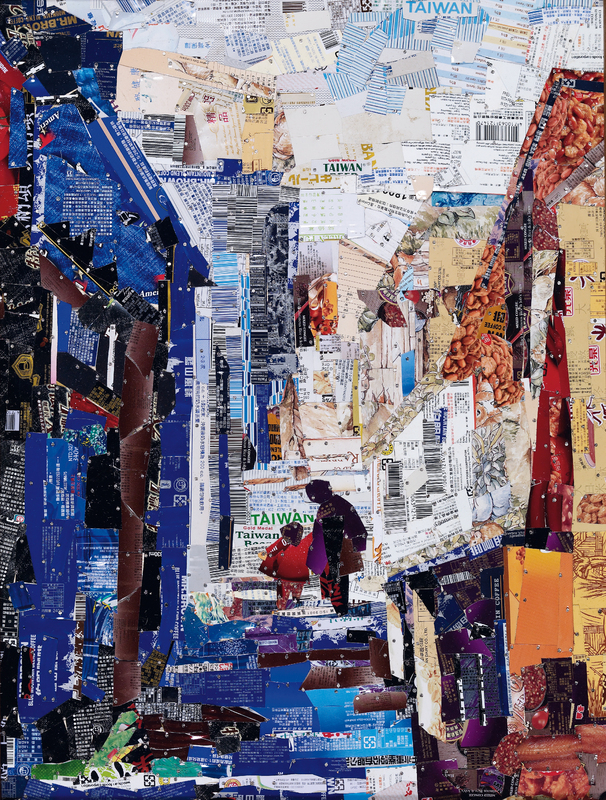 He is not only able to use hammer and nails to produce nostalgic images of Jiu­fen, he has also experimented with other approaches. For example, he drew a pencil sketch of a Jiu­fen street scene, and then used bamboo strips as tools to apply ink to the work. The hustle and bustle of the town’s market comes vividly to life before our eyes. Even more outside the box is that Hu has come out with an album. In 2008, Hu encountered Gao Xian­zhi, a renowned musician who plays folk guitar and the traditional Chinese lute known as the yue­qin, and they immediately hit it off. With Hu writing the lyrics and Gao composing the music, they produced the album Songs of Old Jiu­fen. The songs, written in the Taiwanese language, vibrantly and vividly depict the many facets of life of the intoxicating gold prospecting days. Hu began creating “nail paintings” 20 years ago, and has produced over 200 finished works. Lately he has been focused more on getting out into nature, though he never forgets to stash a sketchbook in his backpack so he can draw wherever his ramblings take him. But if you open one of these sketchbooks, you will invariably also find one or two depictions of Jiu­fen street scenes. While Hu often says, “Having fun comes before creating,” he also remarked to us: “Darn it, I haven’t done any nail paintings yet about gold smelting and refining!” It seems like this metal-mosaic maestro, though now an octogenarian, still has a lot of “can-do” spirit left in him for his beloved hometown of Jiufen.